This is the ninth Memorial Day in a row that I have the privilege and opportunity to write a few words honoring the men and women who have given it all for our country in military service. It is the eighth year in a row that I try to find fresh, new words to express my respect for the more than one million fallen American heroes of past and present wars. There are only so many ways to honor and to express grief and respect -- to remember. However, one does not want to be repetitive as one's message -- sincere as it may be -- is in a way "competing" with those by thousands of others voicing or writing much more eloquent and powerful memorials -- remembrances. Yet, since Memorial Day is all about remembering and since repetition is "the mother of all learning," repetition can only help us remember longer and better -- especially the horrific cost of war.. So, this Memorial Day I would like to repeat -- in full this time -- the emoting, haunting words of Civil War-era orator, Robert Green Ingersoll, a Colonel in the Union Army. These heroes are dead. They died for liberty - they died for us. They are at rest. They sleep in the land they made free, under the flag they rendered stainless, under the solemn pines, the sad hemlocks, the tearful willows, and the embracing vines. They sleep beneath the shadows of the clouds, careless alike of sunshine or of storm, each in the windowless Place of Rest. Earth may run red with other wars - they are at peace. In the midst of battle, in the roar of conflict, they found the serenity of death. I have one sentiment for soldiers living and dead: cheers for the living; tears for the dead. Ingersoll's "Earth may run red with other wars..." certainly was prophetic. Our troops have been sent to fight and die in a score of wars, battles and conflicts since the Civil War. One of those wars was the "War to end all wars" or Word War I. As part of a national effort to formally remember the more than 4,000,000 men and women from the United States [who] served in uniform during World War I" and the more than 116,000 who died in that war, the World War One Centennial Commission will be building a "National World War I Memorial" in our nation's capital. After an international design competition that saw more than 360 design proposals, the Commission, on January 26, selected the design concept "The Weight of Sacrifice" by the design team of Joe Weishaar & Sabin Howard, below. It is expected that the Memorial will be opened to the public by Nov. 11, 2018, the centennial of the Armistice. 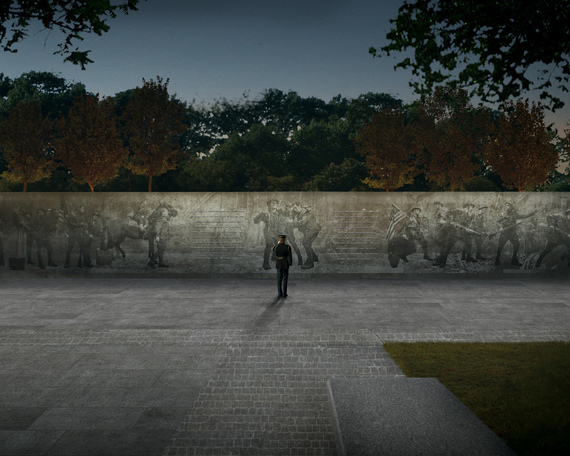 The Weishaar-Howard project overview describes how "the raised figurative walls" of the Memorial visually express a narrative of the sacrificial cost of war. The fall sun settles on a soldier's etched features, enough to alight the small girl patting his horse. Above him 28 trees rise up from the earth, flamed out in brazen red to mark the end of the Great War. He stands on the precipice of the battlefield, surveying the rising tide which has come to call his brothers from their havens of innocence. The figures before him emerge slowly, at first in low relief, and then pull further out of the morass as they cross the center of the wall. They all trudge onward, occasionally looking back at the life that was until they sink back in and down into the trenches. The monument, as is Memorial Day, is all about honoring and remembering. Joe Weishaar, the young lead designer of the Memorial, remembers "100 years ago young Americans just like me were about to head off to fight in WWI, and they fought for the ideals that would go on to define the American century." So, how to honor their sacrifice? How about designing a National World War One Memorial. Young Joe Weishaar did exactly that. The building of this memorial sends a signal, a signal to your families, children and grandchildren that courage, honor and sacrifice still mean something. It is a message to our current and future veterans that they will not be forgotten when their time comes. It is all about honoring and remembering. At the top and below are some repeat -- yet unforgettable -- images of past Memorial Days. 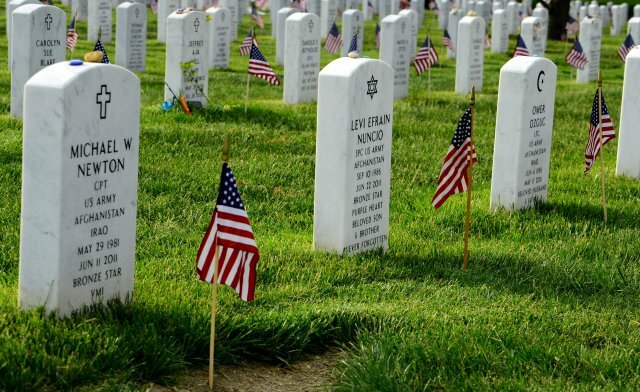 For a listing of VA National Cemeteries that will have Memorial Day ceremonies, please click here. To learn more about the National World War I Memorial and to support this wonderful project, please click here.